Thank you again to our sponsors, Air BP, CharterPad, GetJet, ITIC and Gulfstream for supporting us yesterday, and helping to make the event the great success it was. Thanks also to the BACA Council and staff, and of course you, our members, without whom we could not run these fabulous events. The Lunch was the biggest Spring Lunch to date, with an additional 80 guests seated in our upstairs dining room, linked via live video to our guests and speakers in the Great Hall. With the addition of our “Air Smiles Day challenge”, not only did we raise £3,290 from the raffle*, we finished with a total of around £7,000 for the charity (this will be confirmed once the foreign currency has been exchanged and counted). This incredible sum will fund a Grand Day out for up to 40 beneficiaries AND an additional four Air Smiles Days! * our thanks goes also to our raffle prize donors, Air Charter Scotland, Coastair, Gulfstream, Harrods Aviation, Signature Elite Class and XLR Jet Centres. 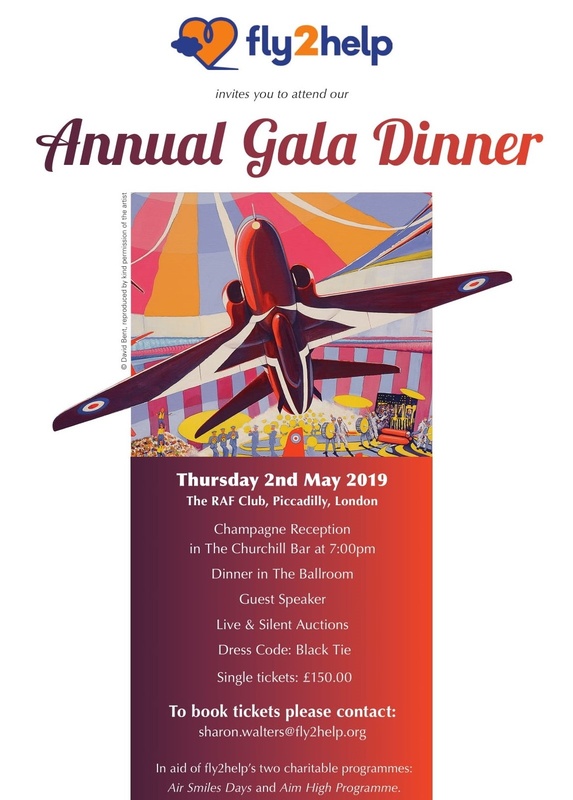 We have also just heard that a table has become available at the charity’s Gala Dinner on 2nd May; please contact the charity direct at info@fly2help.org for further details. Our guests heard from my predecessor Richard Mumford about what we have achieved during his three years and then I was delighted to take over the Chairmanship before introducing speeches from Air BP, fly2help and CharterPad. During the event members were informed of new partnerships with Signature Elite Class, Lazyriver Digital and Sixt for exclusive BACA member discounts. Details can be found on our website. Photos of the event are available via our Flickr page here. Photos may be shared by members but should be credited to BACA and photographer Suzanne Spalding. We are planning a number of further exciting events at BACA in 2019, including our 70th birthday party – please see below for details.